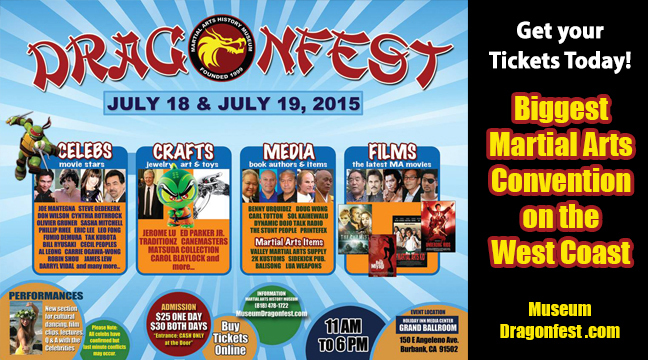 This is it, the month you've been waiting for, it's time for the Museum's DRAGONFEST convention! Yes, you can't believe your eyes. The biggest, the coolest, the most professional reunion of martial arts stars, celebs, pioneers, champions, not-so-champions, extras, stunt people, weapons people, supplies, fun toys and more!!! ALL in one place, it's Dragonfest!!!! When you say? July 18 & July 19. A 2-day event!!! Hang out with the cool cats, get the autographs of your favorite star, buy some great martial arts weapons, canes, sticks, and more. Go to the place that everyone is talking about, it's Dragonfest!!!! Only $25 for one day, $30 for two days. And kids under 16 are only $10 for two days. So bring the kids, bring your school, bring your friends kids, bring your cousin's kid, bring the whole martial arts school to experience Dragonfest!!! You can buy your tickets right there at the door (CASH ONLY) or buy them online at MuseumDragonfest.com. Doors open at 11 am to 6 pm on both Saturday and Sunday. Where? At the Holiday Inn Media Center in Burbank, CA. 100 percent of all funds collected go directly to the Martial Arts History Museum. So don't miss out on the Museum's DRAGONFEST convention.